Adam West & The Batmobile at the Steel City Con This Weekend! That looks great!sign me up! Scooter kept telling me how good these would look and I must say, they came out even better than I imagined they would! Great work! Are the front grilles a little short on the outside edges, or is that just a trick of the lighting…? And, are you going to offer the grilles for the headlights as well? Hi. Thanks Tim, I’ll pass it along to Andy. Thanks Alex too. Harbinger – it must be a trick of the lighting. I don’t see what you’re seeing. And yes – these are just a few pieces of the whole set. Thanks for the comments everyone, it is appreciated. The photos show the PE pieces simply laid on top of the car, not installed as they should be, I was just seeing how they fit. 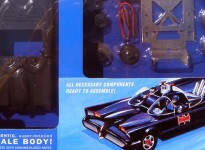 The set does comes with the headlight grills. Ordered em two days ago. They look great. When will they ship? Ah, there they are. Got em today, and folks, the pics do not do them justice. Very nice work and craftsmanship. Scooter, thanks for offering them!